Oh the intricate beauty of a spider web. That’s right. Have you ever taken the time to really examine this amazing creation. So delicate, a mere swipe of the hand destroys it- yet an unusual strength and tautness exist as well- until met with our disdain. Spider webs do not receive much regard with the exception of celebrating Halloween. Stretched and draped around our doors and porches, a fibrous manmade material attempts to replicate the silky labyrinth -yet doesn’t compete with nature’s glorious engineers. It is then that we should stop and pay respect to the diligence and patience of the maker. The equally unappreciated spider. Those tiny little inhabitants of our surroundings, meandering silently about spinning their fine threads. Dutifully able to cleverly complete the task within and around our homes without our blessings. 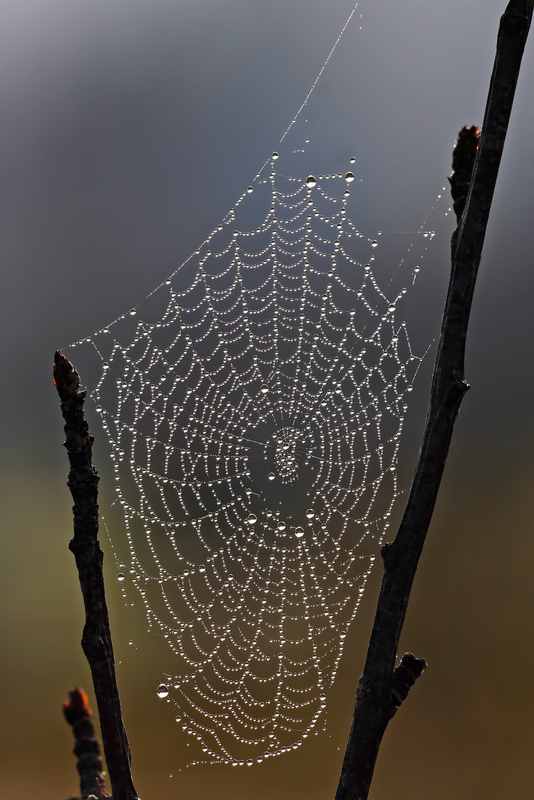 There is nothing more enchanting to come upon than the early morning dew sitting quietly on a lacy spider web. Dressing the fibers with translucent pearls of water- a rather elegant sight. On rare occasions I have found these gossamer necklaces adorning my fencing, lawn and shrubs and I enjoy their endless play on geometry. I am amazed at the tiny arachnid and his ability to instinctively lay out his plan- no blueprint needed. Weaving and working around the nearby structures- utilizing what is given to him and purling his silk with perfection. Sadly though, we take little notice of the spider web until it collects enough dust to validate its presence as a cobweb. By then the maker moved on, again tiptoeing on the tightrope of their design, working their new creation with dedication and resolve. So you see there is beauty to behold and much to marvel at when you come upon one. Whether newly made or filled with the dust of yesterday…truly one of natures endless wonders – the spectacular spider web.